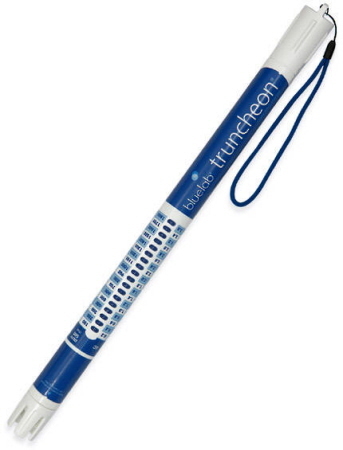 Handy Hint: 95% of all Truncheons returned to Holland Forge as 'Faulty' only require cleaning or new batteries. It's a great idea to buy a Cleaning Kit which contains everything you need, and check out the Cleaning Guide to keep your Truncheon in tip top condition. 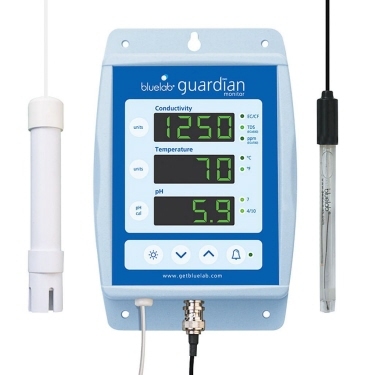 The Bluelab Guardian Monitor constantly measures conductivity, pH and temperature levels, and displays it in an easy to read LED. Many factors determine how fast plants take up nutrients; season, stage of growth, temperature, and available light, just to mention a few. And with these variables the critical elements of the hydroponic nutrient can readily change. The Bluelab Guardian monitor makes the task of balancing these changes easier. This allows you to take a quick look at the monitor, and immediately see the precise levels of the nutrient solution. The Bluelab Guardian monitor has a handy silent alarm function which can bring to your attention a possible problem. Simply set the optimum range you'd like your nutrient solution to be within. You can set temperature, pH and conductivity into the Guardian. Should the levels stray outside these ranges the unit's display will begin flashing alerting you to a possible problem. The unit is mains powered so you don't need to mess around with batteries. It can be mounted in a convenient position close to your system, and the probes can be easily positioned in the nutrient reservoir with the suction holders. EC vs TDS. What do I use ?? 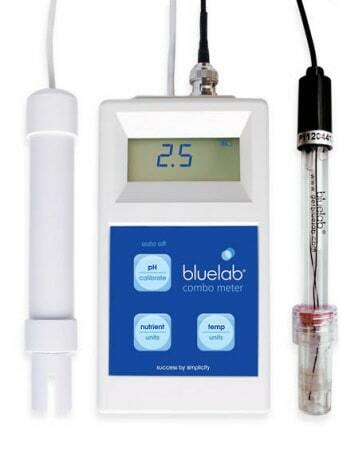 The Bluelab Combo Meter is a portable all-in-one nutrient, pH, and temperature meter which can be used anytime and anywhere. To take a reading - the two probes just need to be dropped into the nutrient solution, press the required mode (pH, EC, temp), wait a minute or two for the probes to adjust to the same temperature as the nutrient solution. View the readout. It's that simple. Remember to rinse between testing different solutions, and rinse after use. The probes should be cleaned regularly to maintain accuracy, and ensure long life of the combo meter. 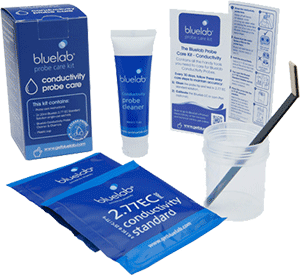 Probe cleaning is one of the most important parts of owning and operating any Bluelab meter. If the probe is contaminated or dirty, it affects the accuracy of the reading displayed. The probe surface is where the instrument takes the reading of the solution. The information is sent back from the probe to the electronic brain of the instrument. A calculation is then done in the instruments brain or micro computer and a reading is then displayed. If the information sent back from the probe is inaccurate due to probe surface contamination then the reading will be inaccurate. Cleaning the probes is a very easy task and prolongs the life of the probes. Especially recommended for use on Truncheons, Combo Meter and Guardian Monitor. Keep your probe clean - it only takes a couple of minutes - and she'll love you for it.